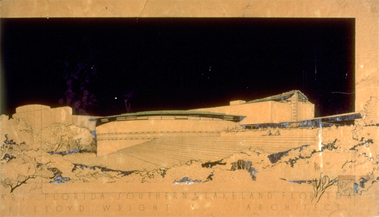 Roux Library was an integral component to a Master Plan for a entirely new college campus designed by Frank Lloyd Wright. The campus is woven into an existing citrus grove and situated along the edge of Lake Hollingsworth. Along with the library, Wright designed other buildings for classroom/seminars, administration, music, science, industrial arts, an art gallery and studio/workshops, faculty housing, dormitories and a chapel. Aaron Green was an apprentice to Wright during this period and was appointed the task of preparing presentation and construction drawings for the Roux Library. Aaron Green worked solely with Wright and William Wesley Peters, who engineered the building structurally and supervised its construction as well. Roux Library is composed primarily of reinforced concrete, both cast-in-place and masonry units. The concrete blocks are cast in a unique design of Wrights, patterned with recesses and small openings filled with cubes of colored glass which enrich the interiors with subtle varied light. The blocks are used elsewhere in all other buildings, creating a continuity of design throughout the campus. A large circular plan form contains book stacks and serves primarily as a reading room. The concrete roof is carried by deep beams expressed on the exterior with no interior support columns to obstruct the flexibility of the open space. A center area of the circular roof is raised up to form a clerestory for allowing reflected natural light in from above. The main stack area is within a long rectangular plan form which runs tangent to the side of the reading room. The main entry is at the junction of these two forms, one on either side. A series of triangular shape light wells penetrate the concrete roof above to provide natural daylighting at the book stacks.